A self contained sewage waste package system comprising of a one piece moulded thermoplastic 550 litre vessel with a screw on lid / inspection with 2 x stainless steel automatic sewage pumps of 460 litres each per min capacity pumps fitted..
Can be free standing in yards or buried in the ground under a inspection cover. Moulded one piece plastic with twin pumps and full control panel for operation as alternative duty and assist, floats included. Supplied with the Biox range of pumps. Operated by a single integral float switch. Includes non return valve and quick release couplings, two 4" 110mm knockout inlet. Outlet discharge are two 2" BSP female thread as standard to allow onsite requirements. Nocchi Vacusystem VS400T-P420M Sewage Station Twin Pump System 230v. 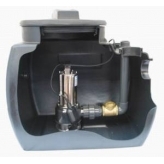 Nocchi Vacusystem VS170-B400 Sewage Station Single Pump 230v. Nocchi Vacusystem VS400T-B300 Sewage Station Twin Pump System 230v.